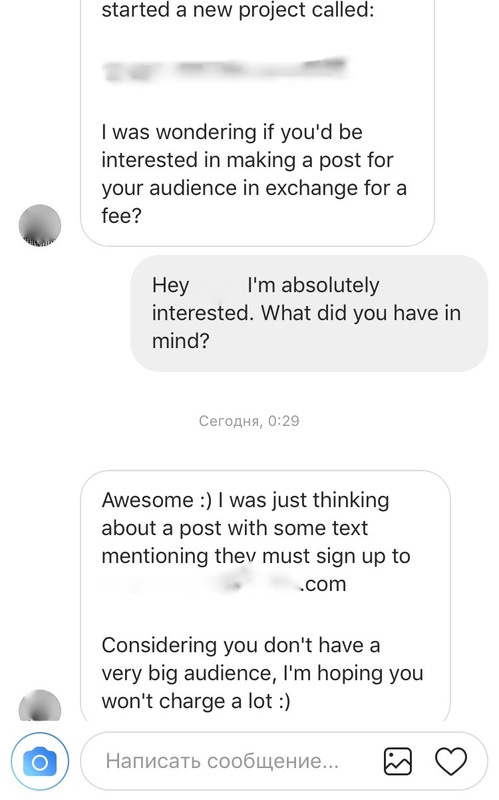 Last week I posted about making my first Instagram collaboration for pay, but they don’t always go so smoothly. Soon after that company contacted me I was contacted by another person looking for a post-for-pay type deal. My first thought was: “Is he negging* me? 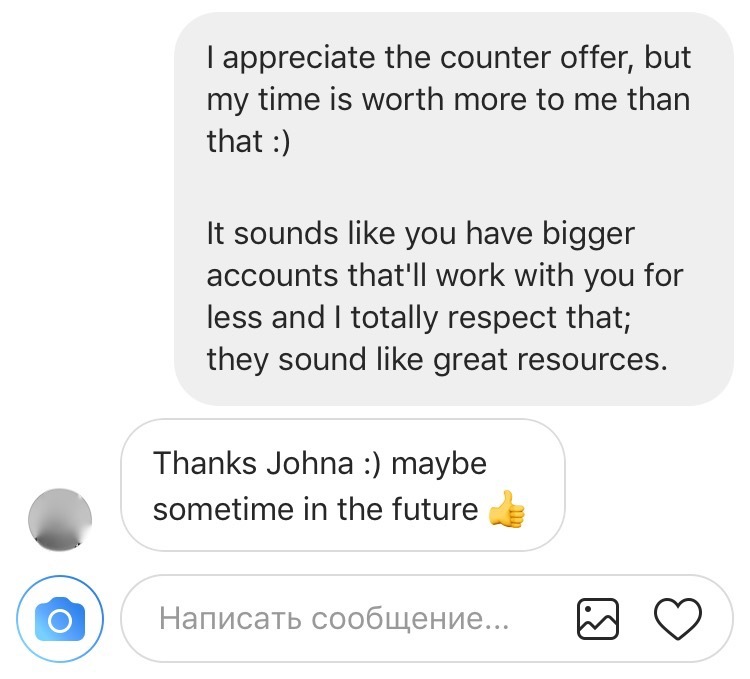 Is he seriously negging me?” I hadn’t asked about price at that point and he didn’t give me a specific budget range, so it was hard to not feel like he was being intentionally condescending. The account in question has 47k+ followers but seemed to be recently struggling with low engagement and they (obviously) knew how many followers I had, but they were still coming to me for publicity. *Negging is when someone insults you to try to lower your self confidence and make you more desperate for their approval. It’s a pretty gross and widespread dating practice that you can read about here. Instead of this, he could have said: My budget is around $20, do you think we can work something out? I can absolutely do a post like that. My standard fee is $10/thousand followers for a post including my face (which currently gets between 6k-20k views) or $5/thousand followers for a flatlay style post (which currently gets 2k-5k views). In return for that fee I’ll curate a post that’s centered around your content – that involves me spending time with your product so I can figure out what’ll engage my audience as well as taking the time to set up a photo. I’ll track the stats over a 24 hour period and give you a report on the growth and feedback after that period ends. After my freshman year of College I spent a couple months living in Beijing studying Chinese. My favorite thing to do on the weekends was to go to the markets and haggle with the sellers – it was a great way to both practice Chinese and get cheap pairs of eye glasses. In the Chinese markets prices are negotiable, if you don’t haggle then you end up getting shang dang’d (made a fool of) because you’re paying 2-3x what the item is worth. The key to those negotiations was respect: the seller knew that they were quoting a price that was absurdly high, but I also knew that if I countered with a price that was too low then I wouldn’t be worth their time. If they didn’t give in I would say stuff like “but I’m a poor college student” or “I don’t have the money you’re asking for, it’s too expensive” and eventually they would lower their price to something more reasonable because they wanted to make the sale. 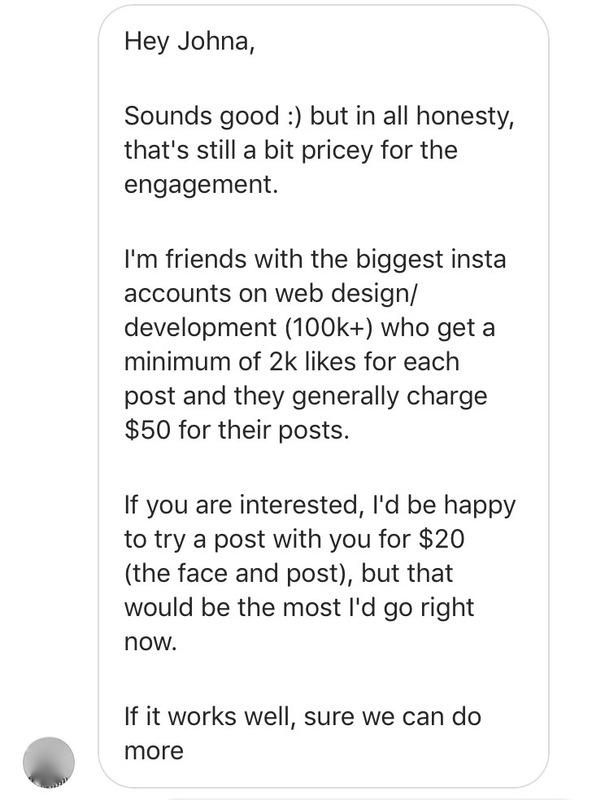 He could have said “I have 47k followers and I usually charge $50” or “In the past I’ve paid $20/post” or “My budget is $20” – Are you seeing a theme here? Instead he made the bold claim that he’s friends with huge accounts and that they give him services for cheap. I did a little bit of sleuthing (because I love research) and noticed that while he had a lot of people following the account, the people he followed generally weren’t that big (he only followed 10 accounts and the biggest account was around 50k). I didn’t want to go through his entire follower list, but I did notice that some people I respect follow the account (the Instagram account itself is a pretty standard Computer Science amalgamation account that posts memes and inspirational quotes so that didn’t totally surprise me). I also did a quick search to see if maybe he had a personal account that had a lot of followers, but no cigar. After watching this video about a food blogger with 180k followers, I have a hard time believing that anyone with 100k+ followers would create and produce content for $50 (and if they are, then they’re seriously undervaluing themselves). I got so distracted by his poor negotiating that he could have said anything and I probably would have still said no. In retrospect, I wouldn’t be surprised if this guy was kind of telling the truth, but that his “best friends with 100k+ followers” were actually amalgamation accounts that don’t post their own content. Much like that fashionvluxury account I posted about a while ago – accounts that don’t produce their own content have it easy because their followers aren’t following a real-live human being, they’re following memes and a topic. It doesn’t matter how cheap they sell space for because they can post 24/7 and it doesn’t impact their day to day life. As someone who generates their own content, for every post I make – whether it’s a dog post or a post of me working at my computer – I have to spend time thinking of the shot and then setting it up. These setups can take 5 minutes or they can take an hour depending how complex they are. If the lighting is bad then I bring in a professional lighting setup. I know I have to post at certain peak times so I can’t just post or do the set up “at my convenience” because if someone is hiring me I want to be able to give them high quality results. I also invest time tracking the statistics on hashtags and effectiveness so I know exactly how well it’s working. I take a lot of pride in being able to produce work that other people actually want to look at. If you add all of these factors up, this means I’m spending several hours on a single post: creating it, responding to comments, tracking the engagement, and running a personal analysis over a 24 hour period on how effective it is. I’m also lending my name to a brand, giving this brand access to my followers, and promising not to post anything in the next 48 hours that will kick their post off of the “top posts” pages. If you hire me then you’re hiring a photographer, a model, a statistician, and a marketing consultant for a 24 hour period of time. If I let someone pay me $20 for a post like that, I’d be getting paid less than minimum wage for doing a (kind of rude) stranger a favor. There are a lot of other things that are more satisfying for me to do with my time. My boyfriend called me out for being passive aggressive in my last message and I don’t disagree. I didn’t want to start a fight with this guy, but also wanted him to know that his shady negotiation tactic was a major reason why I was saying no. Hopefully next time he approaches someone he’ll think twice before he uses this tactic. If you’re trying to get someone to market you on Instagram respect their time and what they do. If all you do is look at their follower count then you’re missing out on the larger opportunity of developing a positive relationship and them helping you with marketing. There’s a lot more to promotional post than likes. If someone approaches you as an Influencer and you feel like they’re undervaluing you or being rude stand your ground (politely). This is a big issue in pay-to-create gigs, and while it might feel like your losing out on an opportunity, you’re also demonstrating that there is value in what you and other content-creators do. The people who respect you will be willing to have a conversation (“Hey, that’s a bit much for us, do you think you could lower it?”) instead of trying to insult you into giving in.